Tradition is defined as the handing down of information, beliefs, and customs by word of mouth or by example from one generation to another without written instruction. Jazz is an ever evolving journey with new roads being explored every day. Jeremy Pelt is a gatekeeper of the straight-ahead jazz tradition while adding his own nuances which will merely broaden and widen the road. At 27, he plays like an old soul who draws his musical being from the ancestors. He grew up in Southern California listening to Billie Holiday and Dinah Washington and his musical influences include Miles Davis, Freddie Hubbard, Donald Byrd, Wayne Shorter, and Terence Blanchard. On his MAXJAZZ Horn Series debut album, Close To My Heart, Jeremy celebrates the emotional ballads. Each of the eleven selections is filled with the lush and rich sounds of his horns. He is quite capable on trumpet and flugelhorn. His notes are well crafted and their rounded tones are perfect. Several of his selections are accompanied by violins, cello, and viola which frame his wondrous horn so beautifully. On the opening Mingus ballad, “Weird Nightmare“, the strings rush in like a gentle breeze as he flows in with his mellow trumpet. He swings brightly on “Excerent” (Pepper Adams) and “Take Me In Your Arms” (Suisse & Norman) which features some great drum work from Lewis Nash. Jeremy plays solo flugelhorn on the Ellington & David ballad “Don’t You Know I Care.” The piece is solemn, reflective and has a certain longing as it tugs at the heart. Pianist Eric Reed contributed the mid-tempo ballad “Piogga Di Perugia” which features Mulgrew Miller on a very nice opening piano solo and Jeremy brings in a certain brightness that gives the tune a reminiscent feel of the Coltrane classic “Giant Steps.” His sensuous horn continues on the Jimmy Rowles ballad “502 Blues (Drinkin’ & Drivin’) which features Peter Washington on bass solo. His horn rings like a bell as he opens “All My Life” (Mitchell & Stept) which is punctuated with lush strings. The cornerstone of this album is the Wayne & Rasch ballad “It’s A Beautiful Evening.” After a string intro, Jeremy comes in mellifluously on the flugelhorn with Mulgrew framing his every note. You can imagine yourself on an evening stroll on the beach with the sun just about to set as you hear Mulgrew tip-toe on the piano and the strings wash upon the shore. It is magnificent. “This Is The Moment” (Hollaender & Robin) features Jeremy on trumpet and David O’Rourke on solo guitar. David also arranged and conducted all the string selections for the album. The album closes out with the beautiful ballads “Why Try To Change Me Now?” (Coleman & McCarthy) and “In Your Eyes” (Loesser). Jeremy also serves as co-producer and arranger on the album. Jeremy can play anything well, from standards to straight-ahead classic jazz to the more contemporary and avant-garde. He has played with Jimmy Heath, Wayne Shorter, Soulive, Bobby Short, Lewis Nash, Bobby “Blue” Bland, the Village Vanguard Orchestra, Ravi Coltrane, Cassandra Wilson, and bands honoring Cannonball Adderley and Duke Ellington. He has toured the U.S., Europe, France, Spain, Japan, and Brazil with his trumpet. He topped the 2003 DownBeat Magazine Annual Critics Poll awards for Rising Star on Trumpet, and the Jazz Journalist Association selected him as one of the Best Emerging Stars in Jazz. After the first listen, this album will touch your heart and with continued listening, it will be close to your heart. Years from now, we will look back on this album as just one of the many bright moments in the formidable career of this brilliant trumpeter. This entry was posted on Monday, October 6th, 2003 at 1:46 am. It is filed under Music Reviews and tagged with Close to My Heart, Jeremy Pelt, trumpeter. You can follow any responses to this entry through the RSS 2.0 feed. 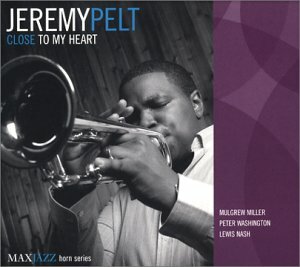 Once again J-Notes.com’s review allows the artist Jeremy Pelt to shine with his excellent examination of Jeremy’s CD. It’s these types of reviews that the avid jazz heads to the aloof ones can all appreciate. great review, i’ve never heard of jeremy pelt, but after listening to some of his mp3’s on his site, i truly enjoyed listening to him, may have to cop this cd. i heard about him via nakachi’s blog.